Mix all the ingredients, except the chicken in a large bowl. Add the chicken making sure the wings are fully covered. Marinade for or couple of hours, even overnight, in the fridge. Pre-heat oven to 160°C (fan). Place the wings on a baking sheet and bake for 30 minutes. Increase the oven to 180°C (fan). Brush the wings with the marinade and return to the oven for another 30 minutes, brushing and turning the wings a couple of times. 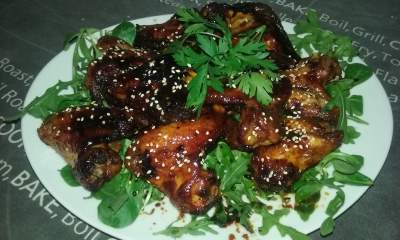 Place the leaves on a plate, add the chicken and sprinkle with parsley and sesame seeds.